I am in the middle of 4 books right now, so I'll pick the two that I find most interesting. 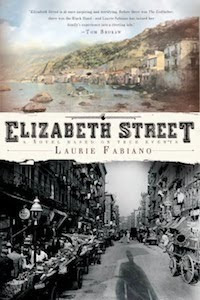 Elizabeth Street is a novel based on true events. It is based on Laurie Fabiano's great grandmother and other relatives from the early 20th century. The book talks of their immigration and the reasons behind it. It also talks about the early Italian-American culture in New York at that time. This is not just a history book, there is a story of tragedy and hope entwined in this book. I discovered this book when looking for books to read about New York City. I love reading non-fiction books about it, and I occasionally come across a fiction book or two that I find interesting, this was one of them. I am half way through, and am enjoying it very much. I recommend this book to everyone, and if someone lives in NYC, they may find it even more interesting, but I think anyone could enjoy this story. *Elizabeth Street is a street in New York City's Little Italy. The other book I'm reading is called Mustaine. It is an autobiography (or as he puts it, A Heavy Metal Memoir) about Heavy Metal guitarist/singer Dave Mustaine from the band "Megadeth". I have this in audiobook format, and though Mustaine himself is not reading this, the narrator that is sounds very much like him. Mustaine talks about his messed up childhood, his messed up parents, his drug riddled youth, his drug riddled adult hood... you know, same old same old. 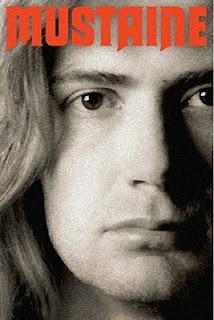 Since I have been a Megadeth fan since 1986, I knew a lot of this stuff, however, I didn't know all. I am not shocked about what I hear, but I am interested. This book is not for all audiences. It is filled with profane language, drugs and violence. I think an interest in the band, or at least Heavy Metal music is necessary to really find enjoyment here. I came across this book accidently while looking through books at audible.com. There it popped up, big as day, of course how could I not buy it? *Dave Mustaine wrote this at around age 47. A good age, I think, to write a first memoir. Elizabeth Street sounds like a great read...I'm going to have to look into it! Four books at once...that is awesome! E-street looks to be a heavy read. I can only read one book at a time. Here's my Booking Through Thursday. That memoir sounds interesting; I hope you enjoy it! Hmmm, you have me intrigued! I'm going to add Elizabeth Street to my list! I've never heard of those books. Elizabeth Street sounds like one to check out. Thanks for dropping by my blog yesterday. A little late with my visit but I'm still here. :) Anyway, never heard of the books but they seem good. Have you entered my 200 follower giveaway, if you haven't CLICK HERE.